The vast majority of Broadband services is delivered to subscribers via telephones on copper wire. 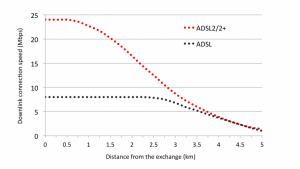 Whether ADSL or VDSL (FTTC or fibre to the cabinet) broadband is affected significantly with the length of copper it travels through – refer graph below. Both ADSL and VDSL are asynchronous products which deliver an acceptable download speed but poor upload speed. Generally at least 5Mbps down speed is required for high definition video steaming. Whilst this is acceptable for domestic use it is not suitable for business use which requires to send and receive data with multiple users simultaneously. Available to 97% of UK subscribers; although some rural exchanges are only ADSL Max enabled (up to 8Mbps down / 0.8Mbps up). ADSL2+ can deliver up 24Mbps down / 1.4 Mbps up although in reality 12-17 Mbps down is good. Price – rough guide – unlimited usage with fixed IP ~ £17 per month + VAT. Fibre to the Cabinet aka VDSL or badged ‘Infinity’ by BT Retail is available to 86% of UK subscribers and can give speeds up to 80Mbps down / 20Mbps up. The much faster upstream speed makes this product more suitable for business although it is still a contended service (shared with other subscribers) and essentially a residential SLA (service level agreement – how quickly it gets fixed) Price rough guide – unlimited usage with fixed IP ~£26 per month + VAT. Leased lines except GEA are synchrous -same speed up & down – with no contention. They generally have a 5-6 hour SLA and are continously monitored – therefore an ideal business solution. Downside is they are expensive and tend to be longer term contracts which pays for the installation. Most common leased lines or private circuits are EFM, Fibre (fibre to the premises) and GEA (Generic Ethernet Access over FTTC). Available in exchanges enabled for ADSL2+ ; arrives to the premises from exchange on copper and speeds dependant on copper distance. There are 2 variants 2 pair / up to 10Mbps (~£160 per month) and 4 pair / up to 20Mbps (~£190 per month). Available where FTTC is and provides same speeds but not shared and with business SLA (~ £160 per month). Top of the range product with best SLA and reliability. Available in speeds 10Mbps up to 1Gbps. Prices start for 100Mbps ~ £300 per month. Interested in our business broadband services?